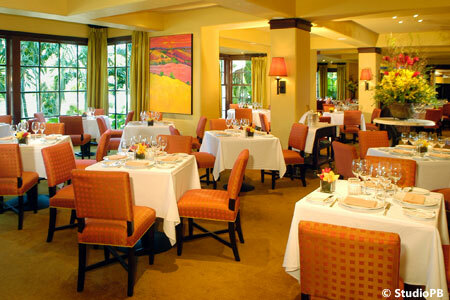 Seasonal French-American fine dining in a glamorous hotel setting in the heart of Palm Beach. Daniel Boulud was GAYOT's 2014 Best Restaurateur in the U.S.
: Restaurateur Daniel Boulud lends his name to this outpost of his empire in the historic Brazilian Court hotel just steps from swanky Worth Avenue in Palm Beach. The dining room glows in canary yellow, amber and terracotta tones with white linen on the tables. Or dine on the outdoor terrace with a gurgling fountain and potted palms. Executive chef Rick Mace oversees the menu that includes French classics such as coq au vin; seasonal specials inspired by the farmers market (ratatouille with herb pistou or carrot gazpacho with yogurt); and interpretations of global dishes like Vietnamese-style caramelized salmon and risotto with royal red shrimp and pecorino. Conclude your meal with Key lime panna cotta with graham cracker streusel. The 400-bottle wine list spans the globe with an American and French focus and 18 pours by the glass.